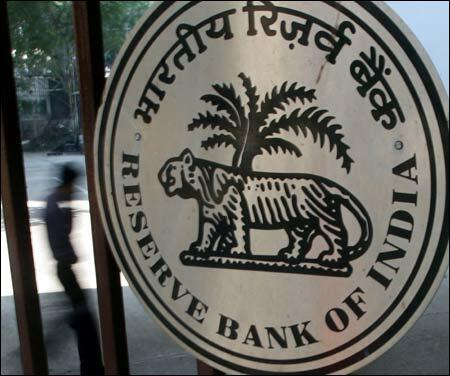 Rediff.com » Business » Fake money: Security breached, admits RBI! Fake money: Security breached, admits RBI! Fake notes as good as real; how to spot them! The Reserve Bank of India has admitted that security features introduced in the higher denomination notes in 2005 as an anti-counterfeiting measure have been breached! In an urgent alert to all private, foreign and public sector banks, RBI has made use of Note Sorting Machines compulsory while handling cash in their branches. The step emanates from seizure of 345 counterfeit notes of Rs 1,000 denomination in series 2AQ and 8AC bearing the signature of former RBI Governor Dr Y V Reddy by the Anti-terrorist Squad of Mumbai. Read on further to find out what happens if you pass on a fake note as real, how to spot a fake note and what to do if you get a counterfeit currency note. . . 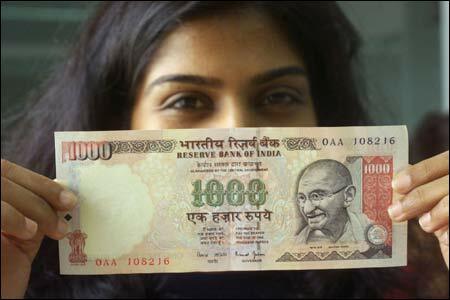 Image: A girl displays a Rs 1,000 note. However, RBI has not issued any warning about avoiding these two series or any other series of currency notes issued by it, a RBI spokesperson said on Wednesday. "We have not issued any warning about avoiding currency notes in the two series," he said. The RBI only educates banks on the "genuine features" and also keeps them apprised of detections made by RBI or banks and seizures made by law enforcement agencies from time to time, he said. The seizure was from four persons of Jharkhand and West Bengal. Image: A man uses an electronic machine to check an Indian currency note at a money exchange shop in Siliguri. The alert to all banks in India says: "This is the first time that counterfeiting of the higher denomination notes pertaining to the 2005-2006 series (notes with new/strengthened security features like optically variable ink, colour shift security threat, etc) has been brought to our notice." Following the counterfeit notes flooding the country from Pakistan, Nepal and Bangladesh since 2000, the RBI had made a lot of changes in the new series of notes, claiming them to be foolproof. It has, however, taken less than four years for the culprits to duplicate the new security features to produce the counterfeit notes in the new series. Pointing out that the first visual impact of these counterfeit notes is very much akin to the genuine note, the RBI circular says the notes were got checked on Currency Verification and Processing Systems / Note Sorting Machines and were treated as suspect and rejected by both the machines. Image: A man walks past the entrance of the Reserve Bank of India in Mumbai. According to RBI, in 2007-08, about 195,000 counterfeit notes amounting to Rs 5.5 crore (Rs 55 million) were detected by banks in India. Trying to pass on a currency note, knowing that is a fake, is a punishable offence under sections 120-B, 420 and 489-A, B, C & D of the Indian Penal Code. 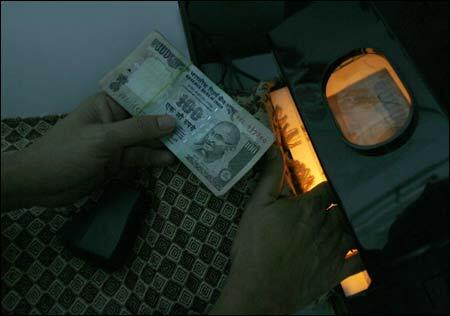 Possession of counterfeit notes too is punishable with punishment as harsh as life imprisonment. So the next time you withdraw money from an ATM, be careful as instances of people getting fake notes from the ATM have been on the rise recently. And if you come to know that you have got a fake note from the ATM and go back to the bank to have it changed, the bank just turns it back on you. 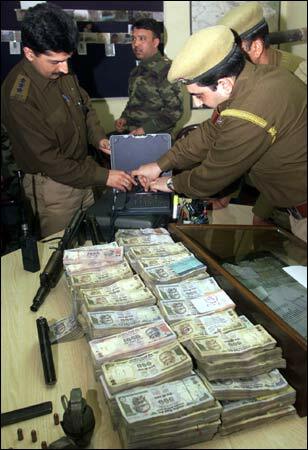 Image: Indian police officers examine seized currency notes in Srinagar. According to RBI, a counterfeit currency note should be given at a bank which will stamp the note as 'counterfeit', and also file an FIR with the police. You need not fear police action if you can give convincing evidence of how you got the notes. Optical Variable Ink: The colour of the numeral 1000 appears green when the banknote is held flat but would change to blue when the banknote is held at an angle. The font size is also reduced. Latent Image: When the note is head horizontally, the vertical band on the right shows an image of the number 1000. Security Thread: The note also has a three millimeter wide security thread with the inscriptions: one thousand, the word 'Bharat' in Hindi and RBI. Micro lettering: The 'RBI' and the numeral, "1000" - which can be viewed with the help of a magnifying glass - are between the Mahatma Gandhi portrait and the vertical band. Watermark: When the note is held against the light, the picture of Gandhi and an electrolyte mark showing the number 1000 appear in the white space. 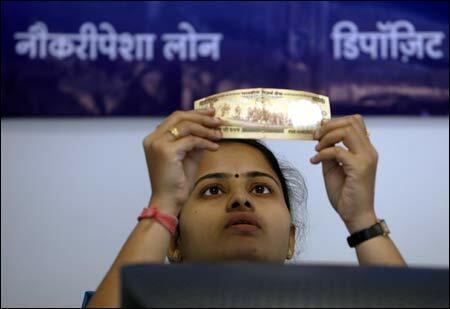 Image: A bank employee checks a Rs 500 note at a counter of Yes Bank's microfinance division in Mumbai. The best way to identify a note is the silver bromide thread that runs vertically through a currency note. Fake currency notes tend to have silver-coloured band painted in place of the silver thread. A real note has a prominent thread with raised 'RBI' markings made on it in English and Hindi. Also, in a real note, the colour of the thread shifts from green to blue when viewed from different angles. The real notes have a portrait of Mahatma Gandhi, the Reserve Bank of India seal, the Ashoka Pillar emblem, the guarantee and promise clause, and the RBI Governor's signature printed in relief. These can be felt by hand in notes of denominations Rs 20, Rs 50, Rs 100, Rs 500 and Rs 1,000. On the other side, a vertical band on the right of Mahatma Gandhi's portrait carries a latent image showing the denominational value of the particular note. Hold the note horizontally at eye level, and this image becomes visible. 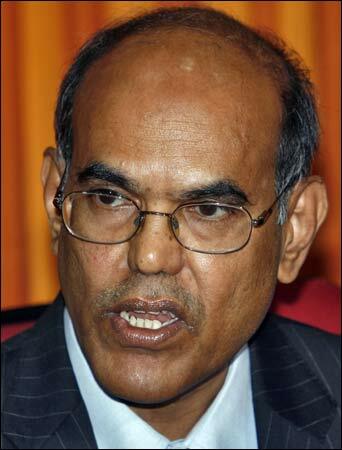 Image: RBI Governor Duvvuri Subbarao.